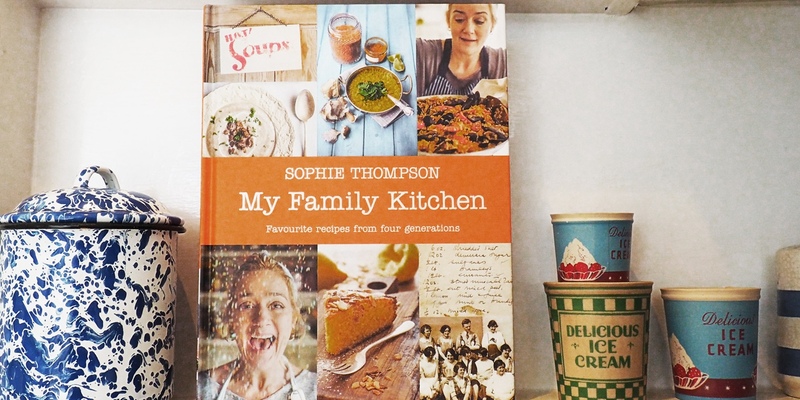 Actress and Celebrity Masterchef winner, Sophie Thompson, has written a family cookbook that is packed with memories, funny stories and delicious food. Camilla Stoddart finds herself happily sucked into My Family Kitchen. 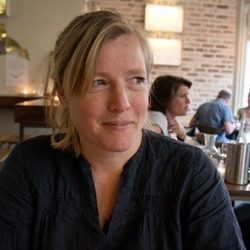 Previously in-house writer and editor for Heston Blumenthal and cookery publisher at Penguin, Camilla is a freelance editor and writer who manages to combine her love of food with her love of words for a living. When actress Sophie Thompson appeared on Celebrity Masterchef, it was hard not to be charmed by her self-depreciating humour and her shambolic but inspired cooking. I have always liked and admired her as an actress and it was fascinating to watch the ‘real’ her, all messy hair and funny voices, emerge as a serious contender with a steely, competitive edge and a natural feel for food. She was the obvious winner for me but she seemed utterly amazed by her own triumph and having read the introduction to her new cookbook, I get the impression she still can’t quite believe it. As she says, ‘I’m just a turn who’s been on a cookery show, so the idea of me piping up about food, let alone writing a cookbook, seems faintly absurd.’ But piped up she has and the result is a vibrant, very personal book, full of colour and laughter and excellent things to eat. My Family Kitchen is not just a collection of Sophie’s own favourite dishes, it’s more of a family gathering with friends, in-laws and neighbours invited to the table. The recipes have been ‘handed down, invented, begged and borrowed’ from the cast of characters that star in Sophie’s life and then customised in her inimitable way to make them her own. Her mother and two grandmothers have clearly had a huge influence on her cooking and photographs of their handwritten recipes, splattered with food stains, appear throughout the book – even one for choc pots scribbled on the corner of a film script! While the recipes reflect the melting pot of international cuisines we take for granted these days – Laksa, Thai fish cakes, Guacamole, Fish curry, Paella, Dhal – Sophie has a soft spot for the British classics of her childhood, such as Devilled cheese, Meatloaf, Beef olives, Clapshot, Squashed fly biscuits, Bakewell tart and Brandy snaps. It is an eclectic collection but perfect for modern family life – there are slow-cooked roasts to feed a crowd at weekends and quick suppers guaranteed to please hungry children, birthday cakes and indulgent puddings for special occasions and canapé ideas for entertaining. Everything seems very doable and you know that all the recipes in the book has been tested and enjoyed many, many times. As well as the recipes, there are photographs from Sophie’s career and from her family life with her sister, actress Emma Thompson, mother, actress Phyllida Law and late father, actor and television presenter, Eric Thompson as well as with her husband, actor Richard Lumsden and their two boys. It’s a fascinating glimpse behind the scenes of this glamorous and talented family who are evidently very close and all passionate about food and eating together. There are lovely stories about where each recipe has come from – chocolate truffles from actress Penelope ‘Keef’, cakes from Uncle James’s café in Scotland, a goulash that her mum got from a landlady in Coventry when she was on tour . . . I could go on but, instead, I recommend that you buy the book and read it for yourself. I am sure you will feel at home very quickly in Sophie’s family kitchen.